The Prius Plug-in is our first plug-in hybrid electric vehicle, equipped with a rechargeable battery that lets you drive further on zero-emissions electric power. Our plug-in electric technology lets you achieve even more with our full hybrid electric system, making it possible to drive further and at higher speeds using just the car’s electric power. The Prius Plug-in uses a rechargeable lithium-ion hybrid battery which lets the car to be driven for more than 50km and at up to about 135km/h with no emissions and zero fuel consumption. Once battery power is used up, the hybrid electric engine automatically takes over, so there is none of the “range anxiety” drivers can experience with battery electric vehicles, which have to be recharged as soon as their energy is exhausted. Plug-in electric technology also allows you to further reduce overall fuel consumption: the more frequently you recharge, the greater the economy gains. The Prius Plug-in’s lithium-ion battery is smaller than the nickel-metal hydride one used in the standard Prius, but it can produce more power. As the “plug-in” name suggests, it can be easily and quickly recharged by being connected to an ordinary power supply at home or at work, or at a roadside charging point. A full recharge takes a little over two hours and we are researching how we can make it even easier with wireless charging technology, so you don’t even have to use connector cables. 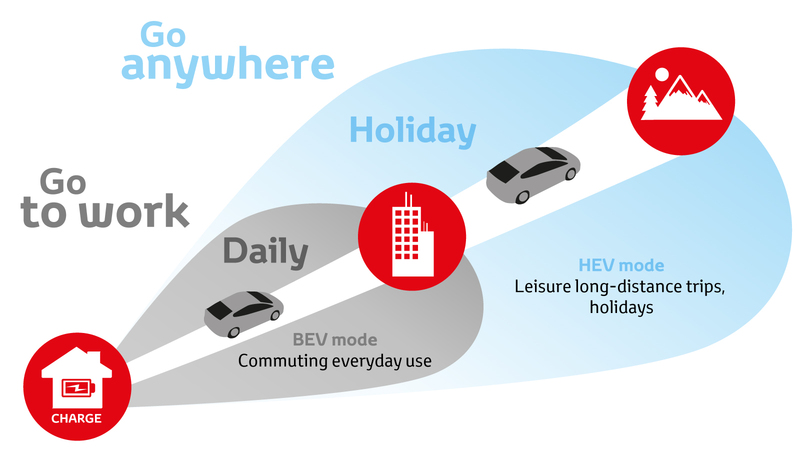 Most typical commuting journeys can be covered using the car’s electric power alone (BEV mode). After recharging the battery in the evening, the car is ready for the next day’s commute. On longer trips, the electric motor and hybrid gasoline engine work together in the same smooth and efficient way as in our other full hybrid electric vehicles (HEV mode). As a result, the Prius Plug-in has extremely low CO2 emissions of just 22g/km. "During the week I use my Prius Plug-in Hybrid Electric Vehicle as an electric car, recharging at home in the evening. On weekends for longer trips, I drive it as a hybrid electric. It’s the best of both worlds!" The Prius Plug-in Hybrid electric vehicle was the world’s first mass-market plug-in hybrid electric vehicle. In the future we expect this technology to be featured in an increasing number of cars, as the recharging infrastructure develops and different car makers work to meet increasingly stringent national and international emissions regulations. We believe plug-in hybrid electric is a natural evolution of our hybrid electric technology and an important means to help further reduce emissions in the future. We are researching how we can make it even easier with wireless charging technology, so you don’t even have to use connector cables. Before we brought our Plug-in Prius to the marketplace, we carried out a three-year research trial with 200 motorists in Europe, including 70 in Strasbourg, France. We wanted to be sure our plug-in hybrid electric technology could deliver the kind of easy, efficient performance we required, so our development programme included a three-year pilot study in the French city of Strasbourg. Seventy cars were used by different project partners, each fitted with data-logging equipment so we could analyse the kind of journeys drivers made, how far they travelled and how often and where they recharged the battery. The information we gathered after four million kilometres of driving helped us fine-tune the Prius Plug-in to make it as efficient and effective as possible, including adjusting its electric-powered range to be sure it could cover the great majority of typical urban journeys. The findings below show performance in comparison to an equivalent gasoline-powered car, unless otherwise stated. We found that the people who recharged their vehicle most frequently were able to spend more time driving in all-electric mode and so use less fuel. A driver recharging an average 1.6 times a day was able to spend 60% of their driving time in electric vehicle mode. Fuel (gasoline) consumption was 69% lower. More driving in electric vehicle mode also significantly reduced the amount of CO2 produced. Thus the motorist recharging 1.6 times a day could reduce their carbon emissions by 61%. And compared to an equivalent diesel-powered vehicle, our plug-in hybrid electric produces between 20 and 54% less CO2. The more often the vehicle is recharged, the lower the overall running costs. Our data showed that a driver recharging 1.6 times a day could save up to €1,400 a year, compared to driving a comparable gasoline car an average 20,000km a year. The Prius Plug-in is equipped with a rechargeable lithium-ion battery. When entering the city, you can easily switch from hybrid electric to full electric mode. With wireless charging, no more cables in the future. We listened to our customers during a 3-year trial project to find out what they wanted. The Prius Plug-in takes you anywhere, any time. The car can be easily recharged from an ordinary power supply at home. A road trip with a difference European travel bloggers experience the new Toyota Prius Plug-in Hybrid Toyota Mirai Awards We have a proud history of environmental achievements. Being the first to mass-produce the pioneering hybrid vehicles back in 1997, we have gone one step further by launching the Toyota Mirai... Prius Plug In environmental information page Our world faces many challenges, from climate change and air quality to energy efficiency and safety. With the Prius PHV (the plug in version of our world famous Prius hybrid vehicle), we are reinforcing the line-up of our eco-car range with a vehicle that offers the best of EV driving for short distances with none of the range anxiety for long journeys. Benefits of Hybrid Whether you’re looking to rediscover your love of driving, reduce the cost of getting around or just have some fun without the emissions – there’s a long list of ways our Hybrids can make a good impression. We choose hybrid Around the world a growing movement of like-minded people that stands over 10 million strong is united in saying, we choose hybrid. Toyota Hybrid sales reach 10 million Twenty years on from the launch of our first Hybrid model, the Prius, sales continue to soar and we are proud to announce a further milestone in Toyota Hybrid growth as global sales pass ten million vehicles. All-New Toyota Prius Plug-in Hybrid Almost five years after the introduction of Toyota’s pioneering first model, the stage is set for the all-new Prius Plug-in Hybrid to redefine the experience of plug-in hybrid vehicles all over again. Discover what makes our new Hybrid’s fully electric driving experience truly special. Long-distance driving with Toyota Mirai - a hydrogen fuel cell car Europe’s network of hydrogen fuelling stations is continually expanding. In practice though, is it really possible to drive a hydrogen fuel cell car from northern Europe to southern Europe? Jacob Krogsgaard, CEO of H2 Logic, put it to the test with his Toyota Mirai.